The heavy swells and robust winds of last night calmed considerably by morning, but we were delighted to learn that we sailed 90 nautical miles (approximately 165 km) between 0700 yesterday and 0700 today. After a breakfast of bread and daal, the crew set about their various jobs. The port watch cleaned the bilges by flushing them with seventy buckets of fresh sea water. Not only did this create a cleaner environment on board, but it gave us a chance to test the back-up pumping system. Towards late morning we had another unannounced man-overboard drill and discussed afterwards various ways we could improve our response to an emergency. The key issue today was devising a safer and more efficient system for lifting an unconscious man out of the rescue boat and onto the ship. Toward this end, Said was asked to create a simple rescue sling which we shall use in future drills. As I write, the full moon has risen–so bright in this clean air that it has turned our nighttime to day. Given that many of our recent web logs have made reference to winds–indeed wind is the single most common topic of conversation amongst sailors–readers might find it interesting to learn a bit about the wind system that most characterizes the Indian Ocean–the monsoon. The monsoon system is unique in the world oceans. Essentially they are semi-annual cyclical winds which blow from the southwest between May and September, and from the northeast from November to March. Although there is sometimes considerable variation in when the monsoon begins and ends in a given year, the overall pattern is quite regular. 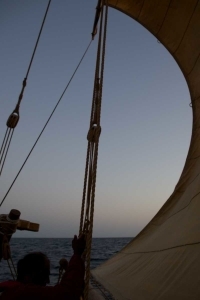 This dramatic and predictable change in the wind’s direction has enabled sailors to navigate successfully between South Arabia and India for nearly 5,000 years. Thus, in an historical sense, the Indian Ocean is the oldest ocean in the world. By expanding and sharing their knowledge of the monsoons over many centuries, Arab sailors enabled commerce, religious beliefs, culture, and ideas to spread throughout the Indian Ocean basin and beyond. The modern concept of “globalization”, therefore, is not new. Certainly the Omani sailors aboard the original predecessor of the Jewel of Muscat were actively engaged in making that concept a reality in the 9th century.